I had a dream last week that a disease was killing the world. 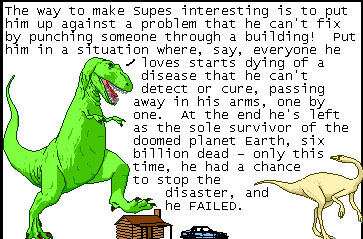 The only person unaffected by the plague was Superman, who's a hardy fellow. He went here and there, watching people die, unable to fix it. At the end of the dream the last person died in Superman's arms. Here's what I'm wondering: did Ryan North have this same dream? Is it an old Action Comics cover that North and I both wandered across in our childhoods and subsequently forgot? All I know is, I had to spend eight hours today listening to a motivational speaker, and the notion of a shared dreamlife where everyone dies but Superman is preferable to a conscious world where organizational coaches are permitted to roam the land unchecked.